The adidas Opticourt Ligra Ladies Indoor Court Shoes help to maximise your lateral and linear moves, with a bevelled heel, adiPrene heel cushioning for great support on impact and adiPrene in the forefoot to help maintain propulsion and efficiency. 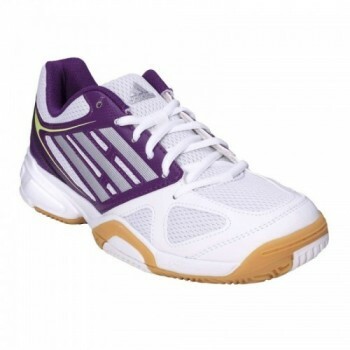 Speed,agility and stability are essential components of any indoor game.The GEL-BLADE 4 Indoor Court Shoe has been designed with these requirements in mind to offer a stable,reliable platform.In this edition,flex grooves have been implemented right across the outsole to divide the medial and lateral forefoot, promoting more efficient turns and accommodating aggressive changes in sideways movement. The Gel-Estoril is a great entry-level tennis shoe offering comfort, cushioning and flexibility for the recreational player. Updated to be faster and more supportive, the Gel Game 7 will be an ideal option for recreational players. Finally a shoe that can be used on the tennis court but also looks great off the court as well! The lightweight, synthetic upper provides support and breathability while the forefoot has been injected with GEL cushioning to reduce shock and keep players comfortable at all times.